It is impossible to ignore the affordable housing problem. The newspapers are constantly reporting of the doom and gloom. The Government is setting up various schemes and initiatives to rectify the problem but there are steps you can take too. If you genuinely want to be a homeowner then you need to plan ahead. As whimsical and romantic as the idea might be, upping sticks and moving house without a second thought just isn’t possible anymore. If you want to move to a new house in a good area you’ll need to plan ahead and star budgeting. The more money you can put down on a new house the better chance you have of getting a mortgage.The further ahead you plan the more chance you’ll have of getting an affordable mortgage on the property you want. And the main thing to start planning for is your deposit. 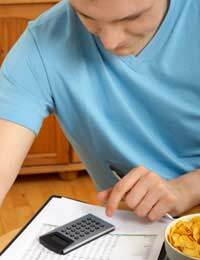 Budgeting in the years or months before you intend on buying a property is essential. There is no point planning on buying a property without making adequate plans. Deciding you want to get on the property ladder is a huge decision and not one that should be taken lightly. Once you have decided you are going to buy a house you need to start making sacrifices. Your first priority is to buy a house. That is now top of your list and therefore should come before any other luxuries. Of course after that you need to start prioritising those luxuries. If you are saving for a house for five or even more years then obviously it’s harsh to expect you to do without everything. It is hard to go ten years without any holiday, new clothes etc. But there are always ways to cut down, from obvious ways to ways you might not have even thought of. Holidays are always lovely but you certainly don’t need two a year and with the one you do take there’s no reason why it has to be expensive. Plan a cost-saving holiday that involves minimal spending. Camping is always an option but if you don’t fancy roughing it look for last minute deals or touring holidays where you stay in bed and breakfasts and guest houses instead of five star hotels. Eating out is a luxury, not a necessity. Of course you can treat yourself on special occasions but keep it to a minimum. Designer clothes may be lovely but they are a luxury. When you’re walking into that bag shop and can feel your willpower slipping remember what you’re doing this for. The prospect of owning your own property is well worth doing without the latest Louis Vuitton isn’t it? The bigger deposit you can put down on a house the less money you will have to borrow from a mortgage lender and therefore the less interest you will pay as the whole sum is less than it would be with a small deposit. Get your first step right and your climb up the property ladder will be much easier.